My KIPP carpool buddy Alaina Pariano and I celebrated the end of our first week of school with a Friday night wine and cooking party. We embraced Alaina’s Italian roots with her family recipes. The menu consisted of salad with homemade dressing and croutons, toasted ravioli, moscato wine and pear crisp. I’m not sure how Italian pear crisp is, but we had an entire crate left over at school and hated the thought of them going to waste. Alaina is such a talented cook, so I forced her to create her own blog. I’ll be posting her link soon! She was kind enough to allow me to post this recipe. I feel like I am plagiarizing by posting it, so I want to make it perfectly clear that this is her recipe and it is OH so good. The cooking time might need to be adjusted based on your oven. Just make sure the ravioli get puffy and crunchy. We’re not looking for soggy ravioli, rather a crisp texture. These can be served as a main dish or as an appetizer. Next cooking party will be Mexican themed with margaritas! Preheat oven to 350°. Pour the evaporated milk in a bowl. Put bread crumbs in another bowl. 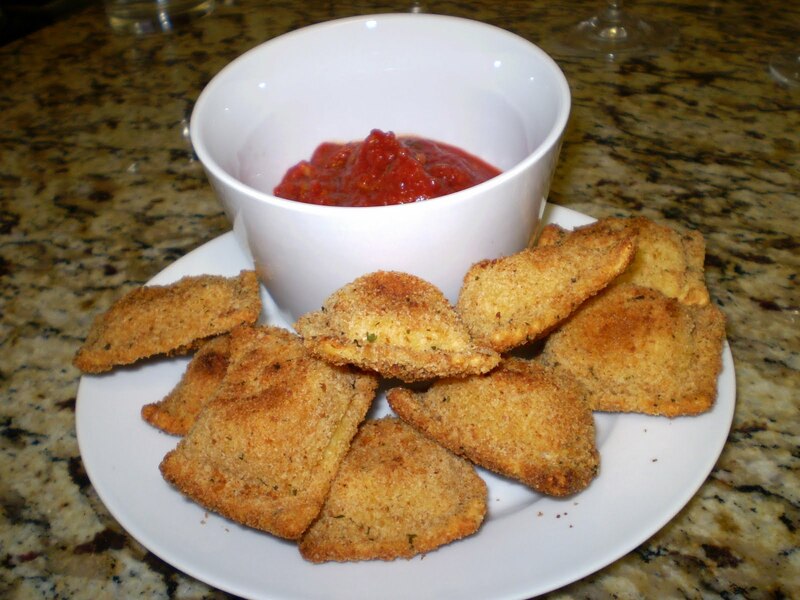 Dip ravioli in milk mixture, and coat with breadcrumbs. You really have to push the breadcrumbs down onto the ravioli so they stick. Drizzle with olive oil, and bake at 350° for 12-15 minutes or until golden brown. Use tongs to flip, and bake for another 12-15 minutes. While the ravioli are toasting, in a small saucepan heat sauce over moderate heat until hot and keep warm, covered. 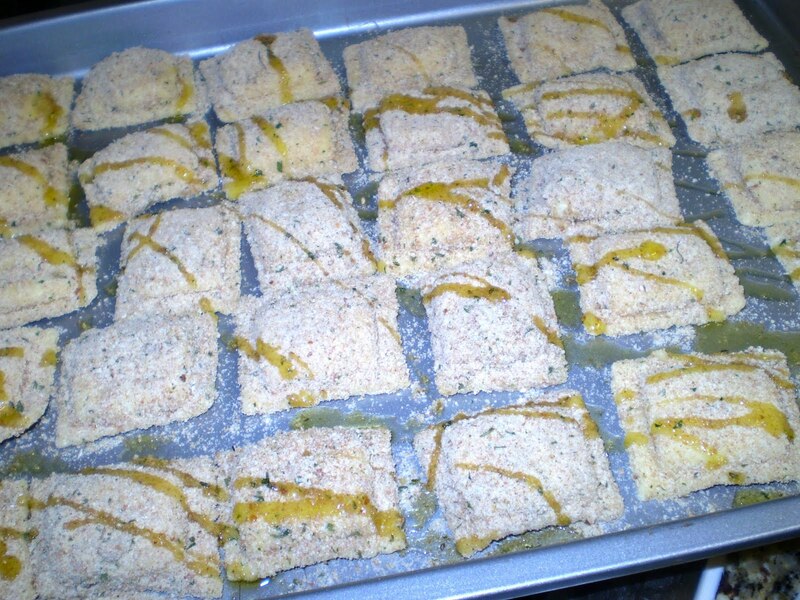 Transfer hot ravioli to a platter and sprinkle with Parmesan.